Coffee and a Book Chick: Merry Christmas...and Do You Track Santa? Merry Christmas...and Do You Track Santa? A very Merry Christmas to all - I can't thank you enough for regularly visiting my blog, reading, and commenting! Wishing you the best Christmas ever. Looking forward to sharing our love of books once again in 2011. Merry Christmas! Love the vintage photos that you've posted. What perfect pictures you included! I so love vintage photography! Wishing you and your husband such a lovely Christmas this year! Merry Christmas! I love the Santa tracker. Love the vintage pics!!! Merry Christmas!!! Happy Christmas - hope you have a lovely day! Merry Christmas! Love those vintage Xmas pics. So pretty! What wonderful vintage photographs! You know how I love those from my header. ;) Merry Christmas! It was so fun to have blogged with you this year, and I'm looking forward to more in 2011. Wishing you a Merry Christmas! Those vintage images are great. A very happy festive season to you! Those pictures are great! I bet you decorate your tree in the same outfit as Marilyn right? haha HOpe you guys had a wonderful Christmas! Oh Natalie! I love the vintage cheesecake Christmas photos! Merry, Merry Christmas!!! Hope you had a lovely Christmas! Love the pics! 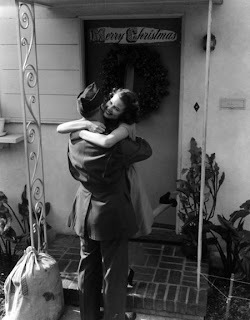 Love the vintage Christmas pics. If only I looked that good next to the tree! What great pictures, hope your Christmas was great. Enjoy the rest of the festive time. Merry Christmas, Natalie! I love those photos, particularly the one of Marilyn Monroe. And for the record, yes, we do track Santa!! I love that pin-up girls had meat on their bodies back then! Hope you had a good holiday and Wishing you the happiest new year! Such great pictures! I hope you had a wonderful holiday!